Banana Sushi is a fun way to get kids involved in making their own healthy snack. Simply peel a banana, add your favourite toppings and then cut into bite sized pieces! Peel the bananas and place them on a plate or board. For the Sprinkles and Chia Seed Sushi, melt the chocolate and pour it on top of the bananas. Add the sprinkles or chia seeds on top and place in the fridge until set. 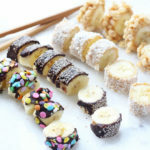 For the Coconut and Rice Krispie Sushi, spread the nut butter onto the top of the bananas and then roll them in the shredded coconut or rice krispies.